Last week as I was leaving Cotonou for Rome, I promised myself to spend the weekend and finalize the last blogpost of the Benin series. Despite all my good intentions, I did not quite manage to do so. And back in the office, I literally got swamped and swallowed by a web of meetings, emails, phone calls and process work. Despite the delay, I sincerely hope that the text that follows recreates my rich experience. Benin has a coastline of 121 kilometres stretching from Togo To Nigeria and an exclusive economic zone1 of approximately 27,750 km2. 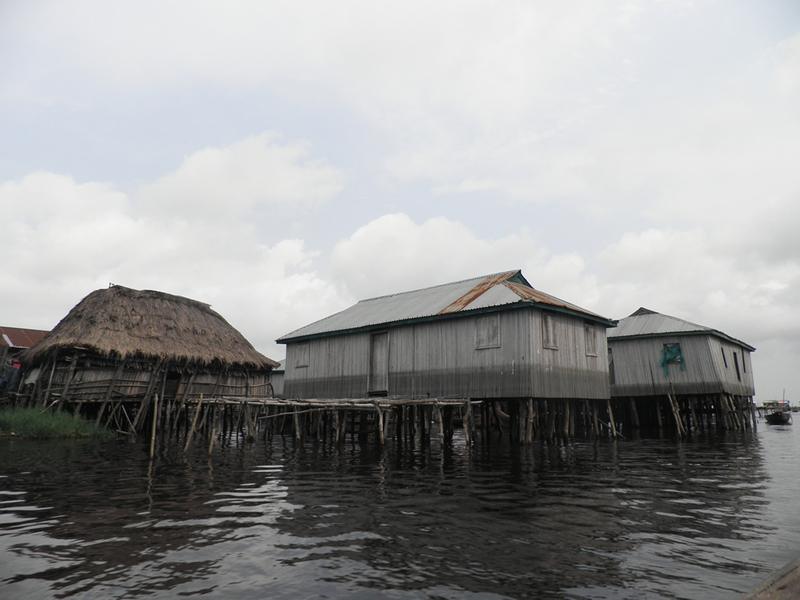 Fishers community living on the riversides, coastal lagoons and lakes primarily practice inland fishing using pirogues. Pirogues are small boats designed in such a way that they can be used in shallow waters and can easily be turned over to drain water that may get on board. Typically, artisanal fishers use paddles, sails and in some cases outboard engines on their pirogues. According to the Food and Agriculture Organization (FAO), Benin’s maritime artisanal fishing fleet is composed of 825 pirogues, more than half operating without an engine and 52,540 pirogue are used for mainland fishing. The country’s fishing sector is faced with challenges such as a decreasing fish stock due to over exploitation and soil erosion which has led to degradation of water bodies. A typical day for an artisanal fishers such as Ambroise Zounon begins at 5 in the morning when he set out for the lagoon in his pirogue. Zounon has a fleet of seven pirogues and uses the acadjas for fishing. Thanks to the training received from PADPPA, he has managed to diversify his activities. He not only earns from his fisheries activities, but is also practicing pig farming and rents out his pirogues to other fishers. “The fish stock in our lake was almost completely depleted”, says Zounon. “Thanks to PADPPA’s efforts, we now have the spawning beds in this lagoon”. 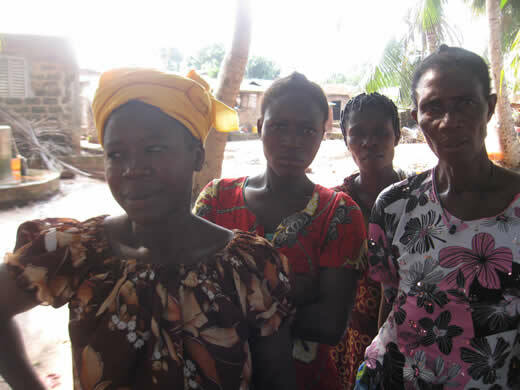 These different methods have allowed Zounon and the other fishers in village of Houinta in Porto-Novo to have a relatively flourishing fishing business which in turn provides income generating opportunities for the women of their community. The clear division of labour in Benin’s fishing practices is quite impressive. For example, fishing crabs and selling fish are exclusively a woman’s job. 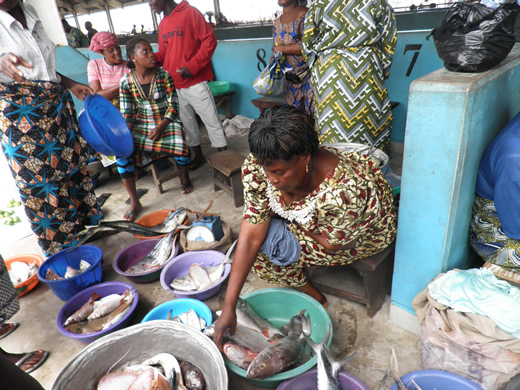 This is why whenever you visit a fish market in Benin, you can be sure to be greeted by a cheerful and colourful army of “mareyeuses” - women fish wholesalers. I challenge you to find a male fish wholesaler in the entire country! The mareyeuses activities is not only limited on land. Even if you venture on a lake or lagoon where men are fishing in the spawn beds or acadjas enclosures, you’ll find the “mareyeuses” on their boats, buying fish from the men and selling it there and then. Eugenie Bocovou is the president of a mareyeuses association which has over 8,000 members. She, like other members of the association, buys her fish directly from the fishers on the lake. 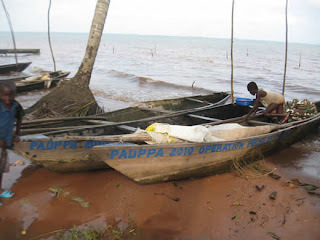 “I leave the house early in the morning for the lagoon, where about twenty men fish in the spawning beds and the acadja implemented by PADPPA”, explains Bocovou. “I buy fish from them and sell it directly on the lake and what ever is left, I’ll bring it back to shore and sell it at the local market”. The mareyeuses not always have storage facilities, such as iceboxes on board of their pirogues. 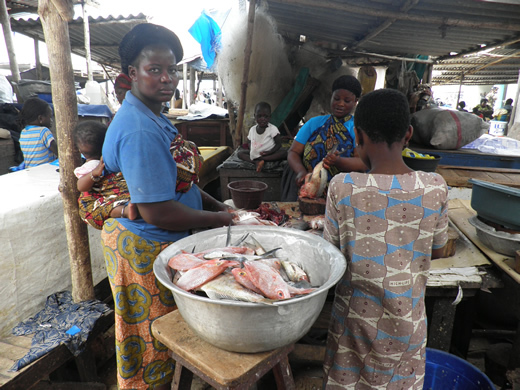 Lack of adequate storage facility, combined with the lack of processing culture, are amongst the many challenges of women fish wholesalers. One of the many new frontiers for Benin’s fishing sector and especially for the mareyeuses is the processing industry. You hardly find anyone employed in cutting, scaling and storage business. In fact, this is an underdeveloped sector. To overcome these challenges, PADPPA has been providing iceboxes to the mareyeuses and has equipped certain communities with fish smoking facilities. Smoking and frying fish are practically the only processing techniques practiced by the mareyeuses. And unfortunately, modern smoking techniques are not quite widespread in Benin. Women still use firewood and rudimentary ovens. This means there is a high incidence of respiratory and eye diseases among women. Furthermore, smoking fish is practiced in less than hygienic conditions. Recognizing the benefits of smoked fish such as longer shelf life and enhanced flavour, PADPPA provided mareyeuses such as Afi Lea Amoussou one of the 12 environmental friendly and clean smoking unit - known as chorkhor ovens. “Thanks to these new ovens, I have better quality of smoked fish because the smoke circulates better and this way the entire fish is smoked. 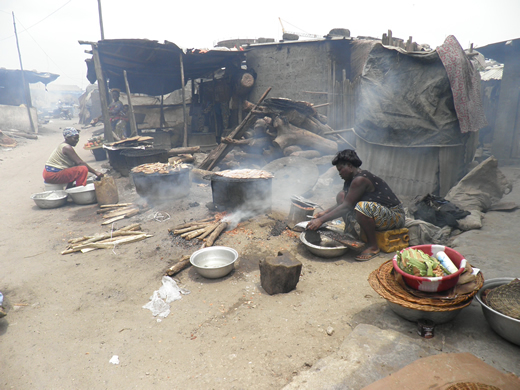 This improved quality means I have better business, I have reduced significantly health hazards associated with smoke inhalation, burns and my eyes do not tear as they used to before”, says Amoussou with a smile. “I manage to sell my smoked fish anywhere from CFA12,000 to CFA25,000”. “We love these ovens, because they do not cost too much to build, I can smoke much more fish, they are easy to use, the firebox is very accessible and I have significantly reduced the consumption of fire wood, which means we have to cut less trees and I do not have to spend a lot of time collecting firewood so I can do other things”, explains Amoussou with an ear to ear smile. Amoussou, Bocovou and other mareyeuses are now running successful businesses and as a result have gained a social status within their communities. It is common knowledge that there are no limits to women’s inventiveness and creativity and the mareyeuses are no exception. Their next frontier is to expand their processing business and to enter the export business, something that Albertine Fanounonsi is successfully practicing. No crab mentality in Benin! Crab fishing is another source of income for women fishers in Benin. 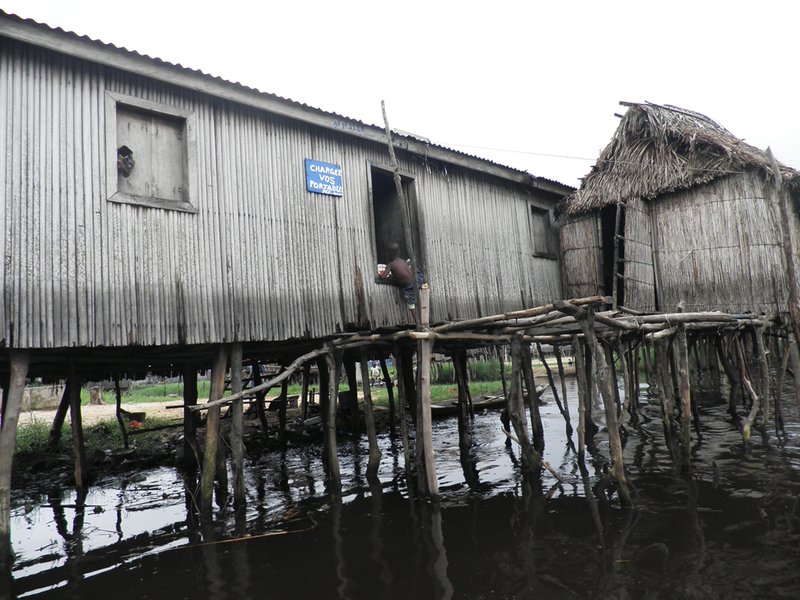 Pierrette Medeho is one of the women crab collectors who lives in the village of Dohi in Comé district on Lake Ahémé. PADPPA provided capacity building to this crab collecting community and equipped the women crab fishers with seven pirogues. 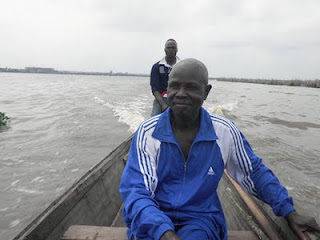 “Before we had our own boats, we used to take our husband’s boat when they were not using them and if we had a bit of money, we used to rent them”, says Medeho. “Collecting crab is a tough job. I go out with five other women”, explains Medeho. “We leave the house at 5 in the morning and if the weather is good, we stay out until 3 or 4 o’clock in the afternoon”. On a good day, the women manage to come back with four to five baskets of crab each. And when they come back to shore, they have Albertine Fanounonsi waiting for them who buys their entire catch. Medeho and her four campions use the money from their crab sale to send their children to school, contribute to the household expenses and they put aside the money they used to pay for rent for a rainy day. Fanounonsi who is one of their main customers runs a thriving “crab export” business to Togo. She has devised a sophisticated delivery system in some ways similar to dabbawalla - the Mumbai lunchbox boys. 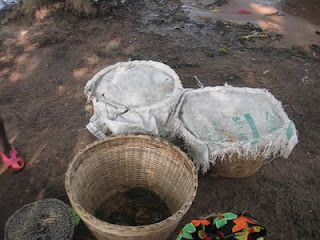 She buys a small basket for 1,000CFA and transfers the contents of eight small baskets in a big one. Fanounonsi’s crab baskets carry her brand which is her business trademark. The crabs travel for two hours on road and then a boat takes them Togo. Someone on the other side picks up her baskets and sells them for her. Amazingly enough, thanks to the branded baskets which act like a bar code on a DHL package or a luggage tag, just like the dabbawalla lunchboxes in Mumbai, Fanounonsi crabs never go astray! Fanounonsi visits Togo once a week to cash the money from the crab sale. On average she manages to sell one of her branded baskets between 9000-12,000CFA. These women crab fishers collect crab, but as you can see they not have a “crab mentality”. For those who may not know what a crab mentality is - it is a metaphor describing how when crabs are put in a basket, they grab at each other and by pulling each other down, they prevent any of them from escaping. There is a lot to learn from the women crab fishers of Dohi village. Their total lack of a crab mentality has allowed the community as a whole to thrive and prosper, with Fanounonsi running a thriving export business and Medeho and her companions running an equally flourshing crab collecting business. 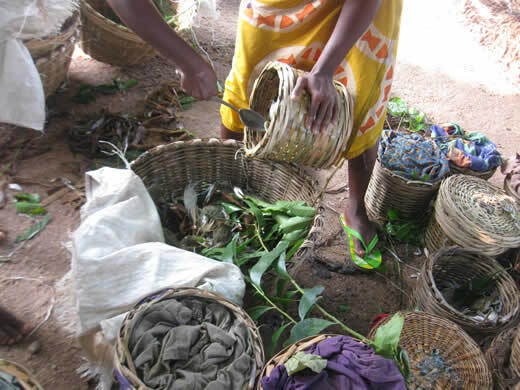 The next logical step for industrious and intelligent women like Fanounonsi is to seriously consider adding value to her business by embracing processing and packing techniques and setting up a global crab export business! One of the last sites that my mentor Daouda Aliou wanted me to visit on this extraordinary trip, was lake village of Ganvie. Ganvie is located in Lake Nokoué not too far away from Cotonou. 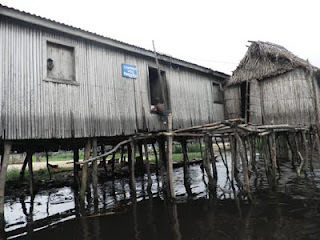 It has a population of around 40,000 people, with 3,000 stilted houses spread out in 11 villages. 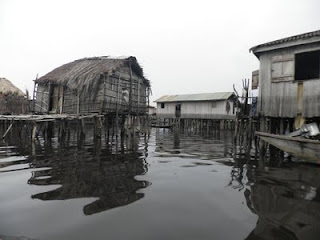 Ganvie village dates back to 17th century when the Tofinu people to escape slavery and the wrath of the Fon warriors - whose religion did not allow them to enter water - settled in this lake village. It lies several kilometers from the shore. To avoid continuous trips to the shore, the inhabitants have organized themselves in such a way that they are completely self-sufficient. The floating markets, similar to those of Thailand, Viet Nam and Indonesia, sell fish, vegetables and fruits and acts like a social hub. 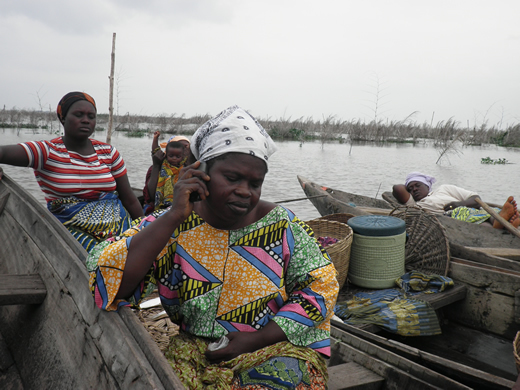 The villagers of Ganvie may have no running water or electricity, but almost all of them have a cellphone. While it is true that the main income generating activity on the lake is fishing, however, as you move around in pirogues on the lake, you’ll come across villagers selling cellphone airtime from their floating houses or running a thriving business of recharging cellphones for 100CFA. I wonder how long it took the “recharge votre portable” gentleman to pay for his generator - which incidentally is the only one on the entire lake! Thanks to PADPPA, the artisanal fishers in Ganvie are using acadjas technique which is helping the polluted lake to restore some of its biodiversity and increase the available fish stock. PADPPA has also introduced alternative income generating activities such as rabbit farming on this extraordinary lake village. “What we really liked about the PADPPA approach was the fact that they listened to and understood our needs”, says BlandineKossou, the President of the rabbit farming association. “We had our share of challenges with the villagers, as they thought that PADPPA was here to give them money and handouts”. “The villagers who understood the scope of the programme and embraced the various activities such as fishing and rabbit farming today have a secure income”, explains Kossou. The rabbit farming association has taken all of this one step further and ever month is putting aside 10,000CFA which is used to buy feed, repair or buy new rabbit cages. 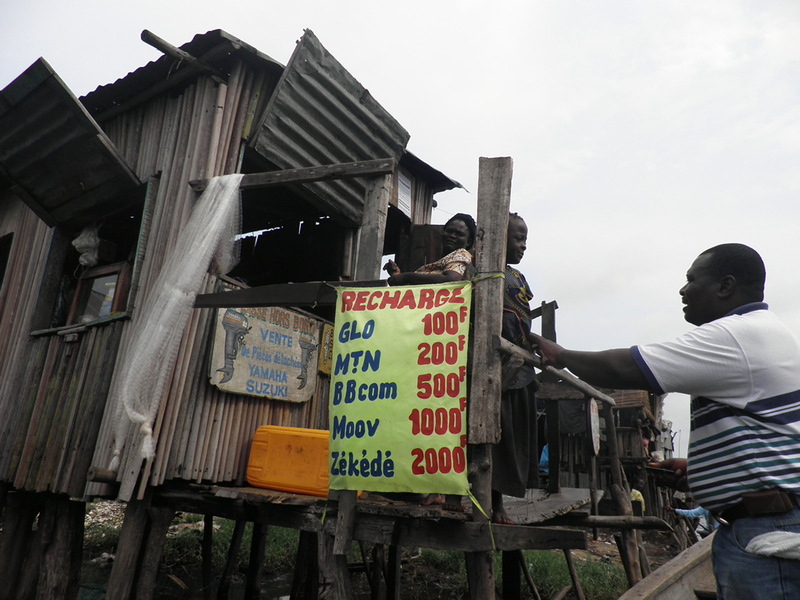 “We could further expand our business and increase our income if we could get a loan, but you know having access to credit is not easy”, concludes Kossou. “It is within this context that IFAD’s next interventions in Benin amongst other things will also focus on rural finance. This will hopefully allow people like Amoussou, Mensah and Kossou to finally have access to credit and be able to expand their businesses and turn their dreams into reality”, says Ndaya Beltchika, IFAD’s country programme manager for Benin. Paul Allognon, Rose Mensah, Kuassi Oke, Vincent Deyo, Afi Lea Amoussou, Raphael Tokpowanou, Eugenie Bocovou, Ambroise Zounon, Augustin Amoussougbo, Pierrette Medeho, Albertine Fanounonsi, Blandine Kossou, Julienne Ebleou, Brigitte Bonou, Hounkanrin Vincent, Afomasse T, Mesmin, Richicatau Sale, Aglinglo A. Crespin, Gérard Gnakadja and, Daouda Aliou. Thank you for your time, for you generosity and for your honesty. Thank you for sharing your stories, achievements, successes, challenges, aspirations and hopes. And I hope I’ve managed to share a sliver of your rich and inspiring stories. Bonne chance for all your future endeavours and I hope our paths will cross in the near future. 1/ Exclusive economic zone is an area of coastal water and seabed within a certain distance of a country's coastline, to which the country claims exclusive rights for fishing, drilling, and other economic activities.